1. Preheat the oven to 200ºC, gas mark 6. Halve the aubergines lengthwise and, using a sharp knife, score the cut sides in a crisscross pattern. Lightly spritz with the oil, then bake in the oven for 25 minutes. 2. When the aubergines are soft, scoop out the middle from each half, leaving a 5mm border around the edge. Set the flesh aside. Place the couscous in a large bowl and pour over enough boiling water to come 1cm over the grains. Cover with clingfilm and leave for 2-3 minutes. Fluff up with a fork and add the reserved aubergine, tomato and mozzarella salad and chopped basil. 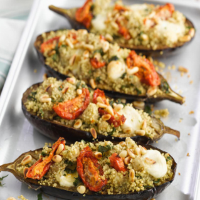 Spoon the mixture into the 4 scooped out aubergines, scatter with the pine nuts and spray with a little oil. 3. Bake at the top of the oven for 10 minutes or until golden and the mozzarella has melted slightly. Serve with the continental salad. This recipe was first published in January 2013.